As my plane taxied towards the gate at Kigali International airport, I could see the glittering lights over the valleys out yonder. This country had risen out of a very dark and painful chapter in their history. I wondered exactly how a family medicine resident would best put his skills to use. I spent a total of thirty days in Rwanda. I was based at Kabgayi hospital in Muhanga district in the southern province about an hours drive from Kigali the capital and right by Gitaramana which is the second largest city in the country. Kabgayi hospital is run by the Diocese of Kabgayi, one of the oldest catholic churches in Rwanda. 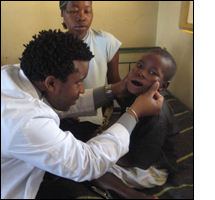 Although Kabgayi hospital was relatively resource poor, they had a few basics. There was access to a decent formulary of antibiotics and medications for your chronic diseases like hypertension and diabetes. There were several times when you were forced to be creative and you improvised. For example, when surgically fixing distal fractures of the radius and ulna, we had to sort through a bin of varying sizes of plates and screws that had been left behind by a visiting Belgian team to find the right fit. Here being HIV positive is not the death sentence it used to be; Cancer takes the crown. Chemotherapy is available to a select few and radiotherapy is all about crossing borders into Uganda or Kenya because it doesn't exist in Rwanda. The system has come a long way and the best part are the people. My Rwandan experience couldn't have been any better. I owe a debt of gratitude to the BJ fund for making this experience a reality. The end result has been an energized, inspired and less doe-eyed-family practice physician about the realities of medicine in a resource poor setting.